The lowest cost tablet in world launched here in India, and made in India. 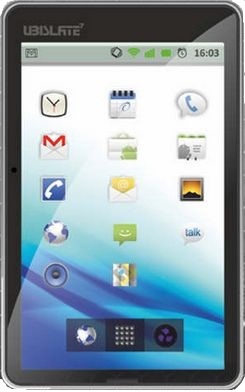 This tablet called Aakash, developed by IIT Rajasthan and DataWind under the Human Resource ministry of India. The tablet launched by by minister Kapil Sibal, with a price tag of Rs 2,250 which only for student .The Ubislate tablet will be available for under Rs. 2,999 with one year of warranty. 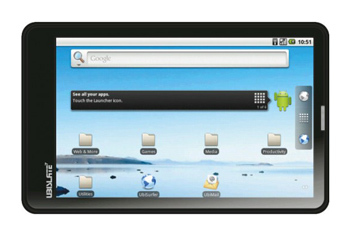 The Aakash tablet has Android Froyo 2.2 operating system. 7 inch resistive touchscreen with screen resolution of 800x480. Supports Connectivity like WiFi (802.11 a/b/g) and 3G (optional through data card). Tablet Features a HD video Co-Processor and graphic accelerator. Tablet comes with 366 MHz processor and 256 MB RAM. Mini and full USB ports Video out, Headphone jack and Audio 3.5mm jack included. Other specifications of Aakash include video-conferencing capabilities, two USB ports and 32GB expandable memory support and 180 minutes of battery power. You can connect it to a data card for 3G or GPRS connectivity. Aakash has a 2 GB in built memory and comes along with a 2 GB MicroSD with support up to 32 GB card. Nimbuzz also announced that the free calls and messaging application will come pre-loaded with the Aakash tablet which weighs is 350 grams. A leather case also included with this tablet PC. This Tablet release date is not fixed yet but it will be available in market at end of November. The main Disadvantages about this tablet is with its Android 2.2 OS, 366 MHz processor and 256 MB RAM but looking at the price of Rs.2999($35) its worth to buy. company will release other models or this is the only one. @arvind Lets hope that they will release more models but for now they r launching this model only.